(How) Do You Test Your Groovy Scripts? 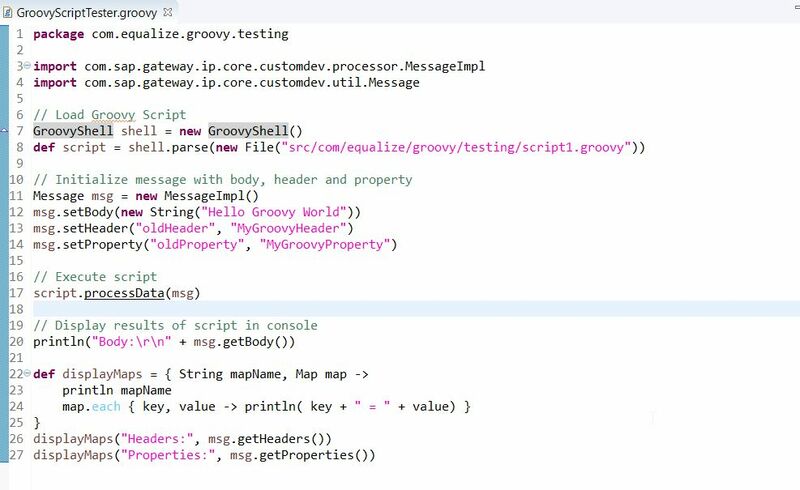 Do you test your Groovy scripts? Or more accurately, How do you test your Groovy scripts? How do you even work with such an editor in this day and age… let alone test anything on it?? 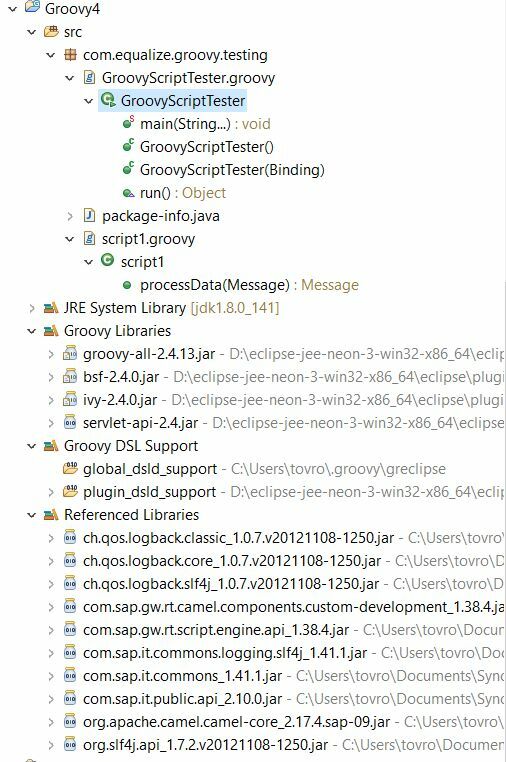 Ok, Eclipse is Groovier, but how do we test? Well, before Vadim Klimov took matters into his own hands, we would have had to rely on creating our own versions of Cloud Integration’s libraries using techniques like Reflecting on the Message class by Morten Wittrock. But fortunately for all of us, Vadim bravely trailblazed the way forward with Dark Side of Groovy Scripting: Behind the Scenes of Cloud Integration Runtime. Before you even continue, you will really need to read thoroughly the above blog, as that is both prerequisite and key. Let’s first create a Groovy Project. For simplicity, I will just copy over the default Groovy script that is generated from Cloud Integration, namely script1.groovy below. 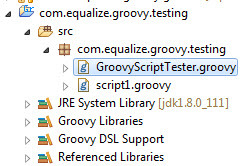 For the other script, I will just create a new Groovy class named GroovyScriptTest.groovy. Now this is where the fun really begins. Did you bother to read Vadim’s blog? You will need it now. Go hunt for the required JAR file, then add it to the project’s build path. Voila! Now, this is how you test your Groovy scripts! Further interesting observation. The online documentation has been updated with details on how to download the JAR file for the above mentioned elusive class, now termed the Script API Methods. The problem with this approach is that it only gives you a real bare bones JAR file. IMHO, if you want to do any serious development/testing work locally in Eclipse, this JAR file is insufficient and not worth the effort. Nice workaround. much needed one. This reminds me stand alone java mapping testing. I am not yet into HCI . Had a little chance to play with HCI long back. message mapping test is available in HCI. It would be nice if SAP does the same with scripts also. and of course changing the colorless editor too. 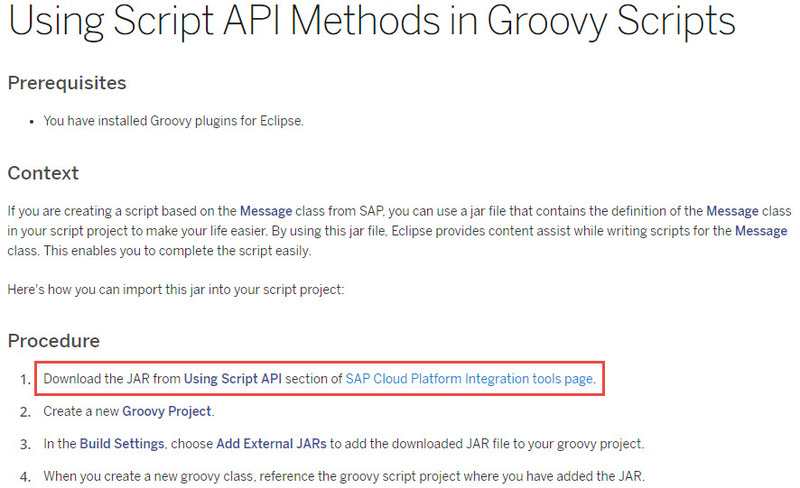 It’s a great blog and very useful for us to work on groovy scripts in HCI. I see there is a link provided in SAP Help portal (https://help.sap.com/viewer/368c481cd6954bdfa5d0435479fd4eaf/Cloud/en-US/062f7a7e5c374e67b568dddc7b7844a9.html) detailing how we can add the JAR file for the Message class into your Groovy project but the link to download the jar is missing. We are working on Groovy script for our complex logic’s which needs to be tested constantly for achieving the results. Can you please share the link to download jar file for com.sap.gateway.ip.core.customdev.util.Message class ? It will be really helpful. You will really need to read the blog properly – as it is really obvious, I won’t spoil the fun for you. 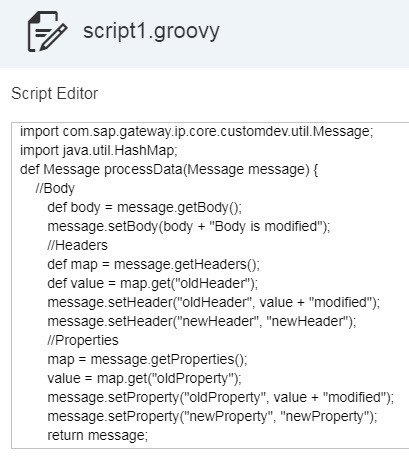 Hi – Thanks I followed the blog ( https://blogs.sap.com/2017/10/02/dark-side-of-groovy-scripting-behind-the-scenes-of-cloud-integration-runtime/ ) and able to fix it. Thanks for your post! It’s great that I could do some local test! I have to ask a similar question with Rajesh’s. 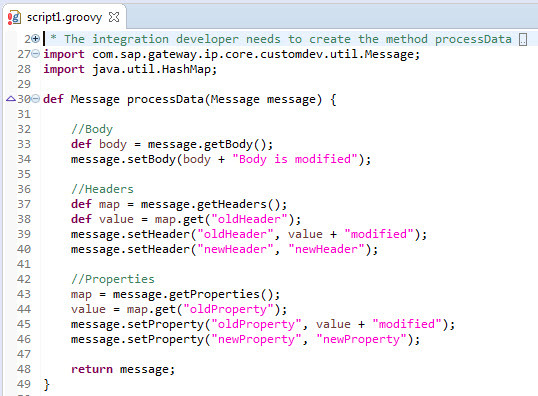 The com.sap.gateway.ip.core.customdev.util.Message syntax is fixed by import jar file as you suggested, however, I can find no hints for com.sap.gateway.ip.core.customdev.processor.MessageImpl Seems this class is not in the cloud.integration.script.apis-1.36.1.jar file. Could you advise a bit? Please see the updated section of my blog (at the end). I wouldn’t suggest using the JAR file provided by SAP in the Development Tools page. Instead, please follow the steps listed in this blog (in particular Hunt, Add, Test, Repeat) and also the details from Vadim’s blog. Let me know if you find the solution. I am also facing the same problem. You are on the right track, but you probably missed out the Repeat step of “Hunt, Add, Test, Repeat” step. Keep going until you get all the necessary JAR files – there are quite a few of them required. It is not very clear where to hunt, I tried to download the JAR for “org.apache.camel.TypeConversionException”, but it does not exist in CPI :S , any idea?. Hunt the same way you got the JAR file for the com.sap.gateway.ip.core.customdev.util.Message class. If you are not sure where to hunt, how did you get that JAR in the first place? 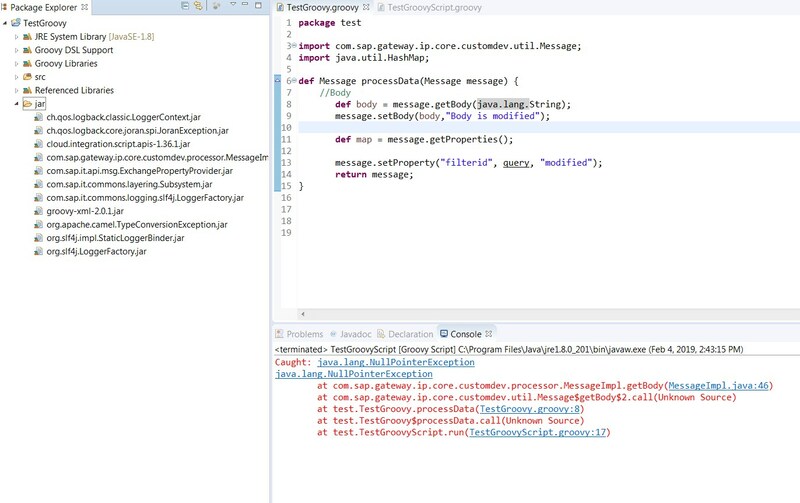 I know how to hunt( identify missing class, run the IFlow in CPI to extract the corresponding JAR and import the JAR in my project, test and repeat), but I can’t identify the missing class ( I thought it was this “org.apache.camel.TypeConversionException”, but I can not download the JAR from CPI, I executed the IFlow for it but it does not return anything), thanks for the replies and your time 😉 . Class org.apache.camel.TypeConversionException is correct, and you should be able to find it in JAR file org.apache.camel.camel-core_2.17.4.sap-09.jar in the current version of the tenant. EXCELLENT! Yes, getting it from PO 7.5 works too! I think I have all the external libraries loaded in eclipse, 10 in total, all retrieved from CPI. I’m glad you enjoyed learning how to fish! Your libraries look fine, so I don’t think there’s any missing there. 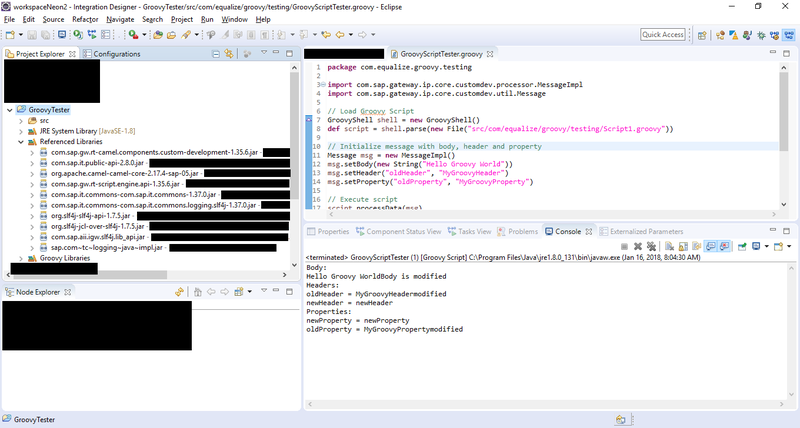 Can you show a screenshot of your project structure as well as the code for GroovyScriptTester.groovy? Sorry for the delay, here are the requested screenshots. I updated my project to java 8, but the error remains the same. Can you show me the contents of your script1.groovy? Hi, I have tried pretty much everything, google, blog search and could the package for below import. It is not part of SAP API JAR. The reason I need this JAR is to be able to create a message for testing. 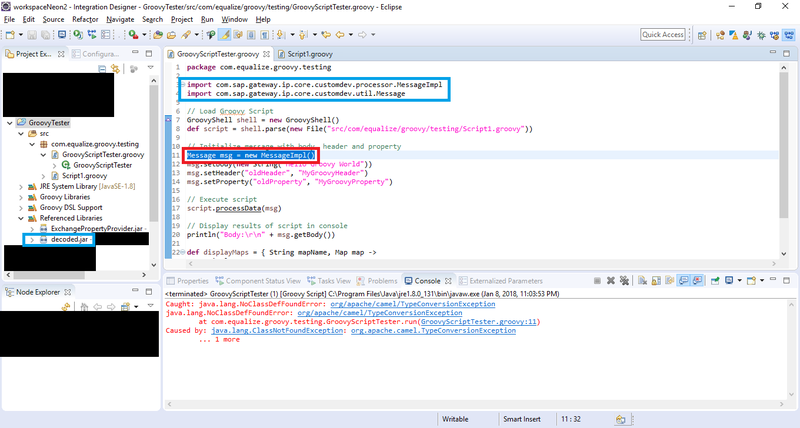 Unfortunately there is no other way to test the script in eclipse unless I am able to create a new message and pass it to the function. Forget everything you have tried, and read closely every word of this blog and what it refers to. Then follow it. Eng Swee Yeoh – Thanks for this excellent write up (as always 🙂 )!! Thanks for your comment, Justin. Glad you found this helpful. Really enjoyed this post, and thought about automating the approach to create the template based on real values. We have added the functionality to the Figaf IRT tool that allow you to test CPI also. So now you can just select a step and then export the content in your format. I have chosen to add a mock class for the message implementation to avoid having to go thru all the libraries as you outline here. It has nothing to do with the JAR files – they look fine. You’d need to debug why line 8 of your script is causing the error. Hi, I encountered the same nullPointerException error. Could you tell me how you resolved it? I was using java.lang.String inside getBody, due to this it was faulting. check the print screen above. JAR file containing class file” jar:bundle://561.0:0/!/ instead of the actual jar. Do you know of another way to get the jar files? It looks like it’s just a different way of packaging the libraries. You still can get to them in a slightly different manner. From the earlier response “jar:bundle://561.0:0/!/”, it is located in bundle 561. So you just go to the following location for bundle 561, and extract its JAR file.